You may give up that right, and anything you say can be used against you. If you choose to waive your right to remain silent, you are solely responsible for the consequences, be they burdens or benefits. The right to remain silent is also the right to not remain silent. Silence has consequences too, and they are easier to predict. By remaining silent, you cannot make your identity known to others, you cannot connect with others, and you cannot impress upon the world your own unique thoughts and values. But it is still your right. Nobody lives without a purpose for long. The institutions of work, society, and commerce will readily provide a purpose, in their own interests, to all those who have not identified purposes of their own. Your purpose is the collection of values for which your life will be lived. They may or may not be your own values. If you have not consciously identified your purpose, be assured that you have been serving somebody else’s purpose. You can invoke your right to a purpose at any time. But a right is not a given. It cannot be relied on to arrive on its own. Freedom is never an accident. It is never stumbled upon haphazardly or granted by external forces. It is cultivated, with purpose and action. Freedom never comes to those who don’t understand what is keeping them from being free. 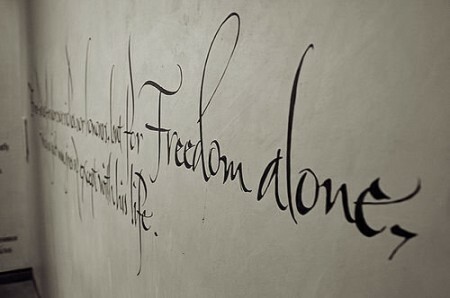 Freedom is undefinable, but it is also unmistakable. If you do not feel free, you are not free. But it is always your right to be free. You will be free when you truly understand why you haven’t been.